October 2, 1900: 28 years to the day that noted London eccentric Phileas Fogg accepted and then won a £20,000 bet that he could travel "Around the World in 80 Days". Now at the dawn of the century it was time for a new "impossible journey." Some old friends have gathered to celebrate Fogg's impetuous and lucrative gamble - and to propose a new wager of their own. The stakes: $1 Million in a winner-takes-all competition. The objective: to see which of them can travel by rail to the most cities in North America - in just 7 days. The journey begins immediately... 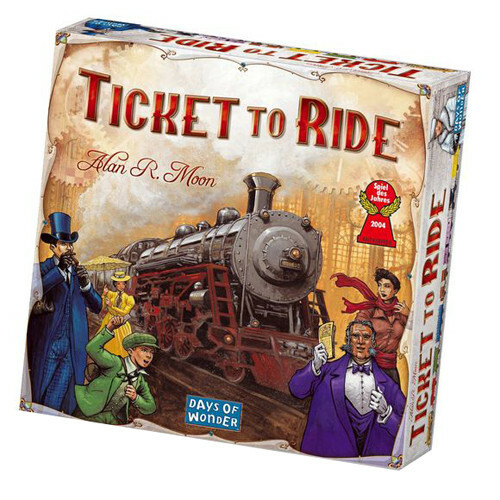 Ticket to Ride is a cross-country train adventure where players collect cards of various types of train cars that enable them to claim railway routes connecting cities throughout North America. It's hard not to recommend this game. I know I'm not saying anything that hasn't been said a million times before about Ticket to Ride, but it deserves repeating. This game is the perfect introduction to "premium" board games. It is simple enough that, having no experience with the game, myself and the 4 people I was playing it with felt completely comfortable with the rules and overall flow of the game by the second turn. Ticket to Ride is the kind of game that offers enough strategy that you'll want to keep coming back, but not so much that it will scare off newcomers. Ticket ride, what a great game! Love that there are different versions. Once you start with the basic game you can get different ones with added twists. It would be a good idea to have some sort of card holder, you can accumulate a lot. Or you can just get rid of them as fast as you get them. I prefer to hold out and try to get as many as possible. Ticket to Ride is a great Euro style board game that is simple enough that everyone in the family can play. You spend your time trying to collect enough cards so you are able to build routes across the United States before your opponents take them first. While doing this you have certain cities that you must connect for a boost of points if you get it, or a penalty if you don't. Overall I really enjoy this game as a family game. My family, however, tends to play its cousin, Ticket to Ride: Europe, because of its more forgiving nature. So if you don't want your opponents messing with your strategy I would pick up Ticket to Ride: Europe instead. I really like this game, I do recommend the 1910 expansion for better gameplay. This is great right out of the box and will be considered our generations Monopoly in time. 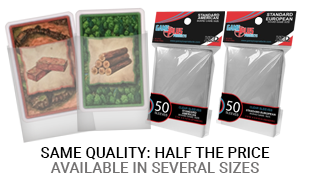 The components are nice, but I do prefer bigger cards, it is manageable. 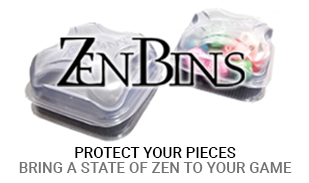 Great buy for the money and will lend to many game nights with friends and family. Simple to teach and learn, with hours of fun. Players take turn gathering color cards and build trains across america, trying to have the longest train, trying to match their destination cards and blocking their opponents at the same time. I consider this a lite game as it is so simple. Lots of fun for all ages. Of all the maps I recommend this one for players here in the US just because it is easier to find locations. When a board game is described as "European", this is the game that jumps to mind first. The competition is more about economics than destruction. The rules are simple to learn, and a turn is when you perform one action--as opposed to the more American feel of a game with multi-phase turns. This game has sort of become a modern classic, and it's no surprise. There's a shallow learning curve and lots of replayability. The game scales nicely to four or five players but is just as fun with only two. My only complaint would be that the cards are teensy, so if you enjoy the game, consider picking up the 1910 expansion which has large-form cards in it. Ticket to Ride is a good gateway game. It can be taught in 5 minutes, even to more casual gamers. The rules are very simple. The challenge is in reading the situation & deciding whether to grab up the routes when you can, and risk your opponents blocking you or waiting until you can grab a few on consecutive turns. Unlike many of the games i pick up on miniature market, Ticket to Ride is completely accessible to kids, parents and grandparents alike. Turns move quickly and you rarely feel bored. The mechanics are easy to grasp, and incorporate just enough luck to give newer/younger/less super competitive players a shot. We've had some fairly intense multi-generational sessions of Ticket to Ride at our home - even the non-gamers tend to enjoy it. I'd recommend it to anyone. This game has become a favorite of our family. I now have the board game and I have it on my computer, my IPad, and my IPhone. It is addictive. A game of skill. Well worth the cost. We have a gaming group that meets once a week and we needed something new to occupy the kids on 'grown up game night', LNOE, DnD, Pandemic etc . So I decided to give this game a try. The group always test drives a game before we turn it over for destruction. We had a blast! The game is very easy to learn and play but is by no means a 'kiddie game' Ticket to Ride is one of those games that we can play with the youngins without having to hold back. Many a night we have played young vs old and got our butts kicked. . If you are thinking about buying Ticket to Ride do yourself a favor and order the 1910 expansion at the same time.